Ray Bradbury first wrote The Screaming Woman as a radio play (broadcast November 25, 1948), publishing a short story version in 1951. He would adapt the tale for television himself for a February 22, 1986, episode of The Ray Bradbury Theater starring Drew Barrymore. In between, producer William Frye filmed the story as an ABC television movie directed by Jack Smight from a teleplay by Merwin Gerard (swapping the child protagonist in Bradbury’s original version for an older woman). Montecito dowager Laura Wynant (screen legend Olivia de Havilland, in her TV-movie debut) has just returned from a five-month stay at a sanitarium when she notices a neighbor’s dog acting strangely on the grounds of her estate. Investigating, she hears the voice of a woman who has been buried alive. Her son, Howard (Charles Knox Robinson), and daughter-in-law, Caroline (Laraine Stephens), fail to believe her, interpreting the far-fetched tale as evidence that she should be committed to a mental institution — which would allow them to sell her estate to a developer and pocket millions. Even her trusted friend and attorney, George Tresvant (Joseph Cotten), becomes dubious when he and Howard investigate but find no evidence of the screaming woman. A sheriff’s deputy likewise rebuffs Mrs. Wynant, as do all her neighbors except Carl Nesbitt (Ed Nelson) — who buried his wife alive, thinking she was dead after striking her on the head during a heated domestic dispute. Otherwise, only Dr. Amos Larkin (Walter Pidgeon) doubts the psychological explanation for Mrs. Wynant’s bizarre behavior. 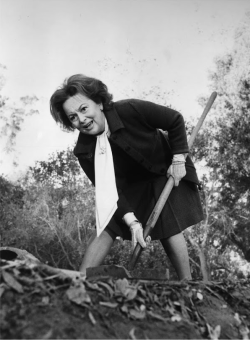 The Screaming Woman debuted at 8:30 p.m. on Saturday, January 29, 1972, as ABC’s “Movie of the Weekend.” In the Los Angeles Times, Kevin Thomas called the film “diverting,” commending de Havilland’s “wonderfully well-modulated, exquisitely timed performance, alternately calm and hysterical, created from within and expressed with superb technical finesse.” The syndicated TV Scout column deemed the film “a gripping drama,” while Cynthia Lowry of the Associated Press assessed it as “a pretty good horror story,” lauding de Havilland’s performance as “excellent” and Sam Leavitt’s photography (shot on location in Santa Barbara and Pasadena over 12 days) as “noteworthy.” The legendary Edith Head created de Havilland’s costumes. On November 30, 1971, members of the Composers and Lyricists Guild of America began a strike aimed at wresting some amount of control over the music they created for film and television away from their employers. The strike lasted until the first week of February 1972, when 71 individual CLGA members filed a $300-million class-action suit against the major Hollywood studios and television networks. During the months of December and January, studio music departments scrambled to fit pre-existing music to recently completed pictures — or hire composers willing to cross picket lines (as was the case with New York–based Wladimir Selinsky, who scored Steven Spielberg’s TV movie Something Evil). For The Screaming Woman, which did not begin shooting until mid-December, Universal Television music director Hal Mooney cobbled together cues by Jerry Goldsmith (according to BMI records) and Morton Stevens (according to ASCAP) from the studio library. 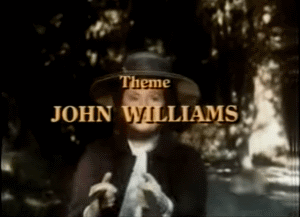 Yet the only onscreen music credit (aside from Mooney’s as music supervisor) was “Theme: John Williams” displayed over the end credits and undoubtedly referring to the final 43 seconds of music heard in the film. Exactly when (and for what purpose) Williams wrote this theme remains a mystery. No music from The Screaming Woman (including the Williams theme) has ever been released in any format. This film has never been released on video. University Press of Mississippi, 2004. 208 pp.